"You see this place on the image? 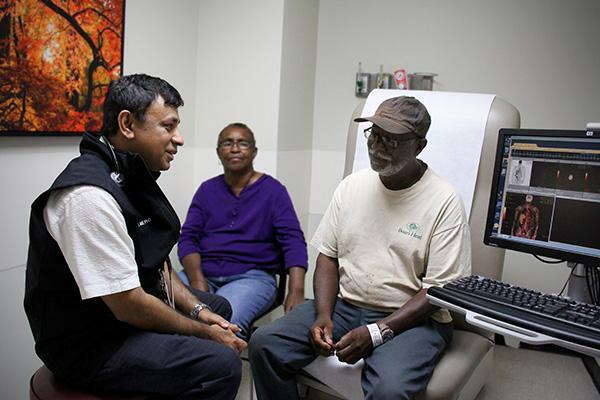 That's where your kidney was," says VCU Massey Cancer Center medical oncologist Asit Paul, M.D., Ph.D., to 69-year-old Thomas Bland. "And the tumors we saw in your lung and other places still have not returned. I'm happy to say you've been disease-free for more than two-and-a-half years." After recovering from extensive injuries caused by the car accident, Bland had his left kidney and adrenal gland removed. The tissue from his removed kidney showed a rare but aggressive form of kidney cancer known as sarcomatoid kidney cancer. Sarcomatoid kidney cancer occurs in only 5 percent of all kidney cancer cases. Most kidney cancer patients survive less than a year because of quick cancer spread and poor response to standard treatment, which may involve a combination of targeted therapy and chemotherapy. Nivolumab, also known as Opdivo, was approved in the U.S. in 2015 for the treatment of advanced kidney cancer that does not respond to conventional therapy, based on the results of the CheckMate 025 clinical trial. As a checkpoint inhibitor, nivolumab blocks specific proteins that prevent the immune system from attacking cancer cells.